The cabinets of the L-series really rock the house with thundering lows and a focused crisp midrange. All L-series cabinets offer two "all-access"-handles, slip resistant rubber feet, black tolex, Speakon® Combo connectors and our Tweeter Switching System. This allows both aggressive rock, and soft funk and fusion settings in six stages. This makes our cabinets ideal for all genres, playing styles, and sonic preferences. Due to the small dimensions of the cabinets the housings are specially calibrated so that the high-power speakers guarantee faithful reproduction of all nuances. By using a voicecoil with windings on the inside and outside of the coil, it results in a 40% higher continuous power of the loudspeaker. Even at their highest output level they provide distortion-free, clean, and ultra dynamic sound reproduction at sound pressure levels far exceeding that of club applications. 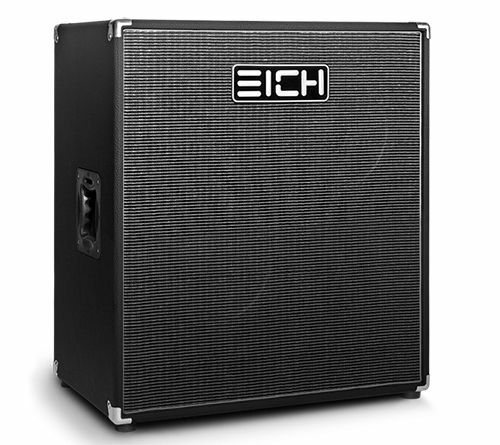 Through the available impedances of 4 or 8 ohms, the strain relief for the guitar cable in the left handle, and the Ampfixing which guarants secure positioning of EICH-amps, the 212L surpasses all other market offerings with its superior sound quality, robustness, and reliability.